Aaron Rodgers wore a smaller, lighter knee brace for the first time since sustaining his season-opening injury on Sunday and he hopes to do it again. The Green Bay Packers quarterback's new look was battle tested on the first drive against Detroit's defense, and unfortunately, it did not pass. 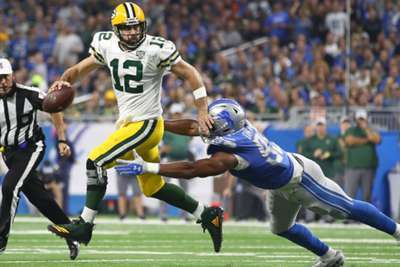 In the 31-23 loss to the Lions, Rodgers took a big hit from linebacker Christian Jones and the brace did not do much to cushion it. Rodgers told ESPN it was a setback. Now, Rodgers may have to go to wearing the larger brace he sported in the three games immediately following the injury to his left knee. Rodgers did not practice on Thursday but that is not alarming news as the Packers' practice schedule shifted in preparation for their game on Monday against the San Francisco 49ers. He said he hopes to practice on Friday, which will incorporate full-pads workouts that normally happen on Thursdays. In Sunday's loss, Rodgers threw for 442 yards and three touchdowns. He also had two first-half fumbles, both on strip sacks, which is only the third time in his 14-year career he lost two fumbles in a single game. "Yeah, kind of a setback last week, the beginning of the week," Rodgers said. "Got to be in the rehab group again today, got a lot of good work in with [assistant trainer] Nate [Weir] and just hoping I get back out there tomorrow and have a feel-good Friday and a practice [Sunday] and be good to go – hopefully back to where I was in Detroit."